Here are some examples of the projects we've implemented to benefit communities in Morocco's Ouarzazate Region. All photographs are provided by the project managers of CIFD. A diverse group of community members spanning all generations and 27 elementary school students came together to learn about environmental issues and improve the area around the Tiguerte School. The project helped boost the community's role in the village. We partnered with the Association of Parents and Guardians of Students of Tiguert to provide water supply to the Ait Ali Ikon School. We purchased and installed a water tank, support for the water tank, a water supply pipe, water pump, and water accessories. As a result, 58 students now have access to functional sanitation facilities, which encourages attendance among students, especially girls. 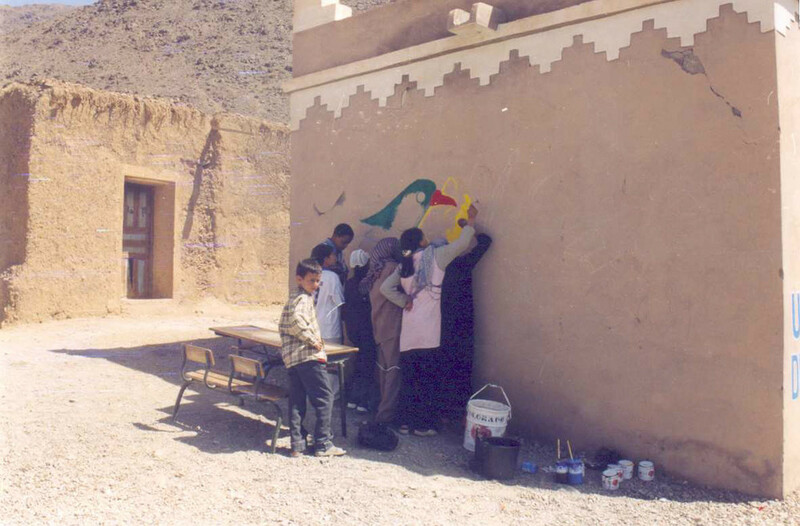 As a part of our ongoing efforts to enhance education in the Ouarzazate region, we have partnered with area Associations of Parents and Guardians of Students to implement a number of extracurricular activities, such as music, theater, art, and games. Through careful planning and training, we have been able to empower the Parents and Guardians of Students Associations to develop their skills in organizing and implementing such activities.